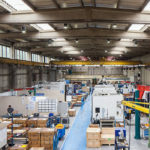 Award winning brand, Goodlight, has announced that Middlesex Aerospace, a leader and strategic manufacturer of aerospace engineering components, has made between 50-80% energy savings following the replacement of its old fluorescent lighting with energy efficient, low maintenance LED tube lighting from the Goodlight range. Innovation is a word often over used with industry that generally sees the inclusion of increasingly more complicated electronic systems. Premitec UK is celebrating the 10th anniversary of its first scrap shaker unit to be installed in the UK. Baxi Boilers of Preston, took delivery of the unit in November 2005.